When you see the basketball. DALLAS — If the Mavericks were going to do what needed to be done on Tuesday night in the finale of their 2018 season, it would take an almost herculean effort. A guaranteed share of the NBA’s third-worst record and the attendant lottery-odds boost was on the line, but they would have to lock in, focus up, and play their shittiest. Nothing less than the worst would work if they wanted to lose to the Phoenix Suns, a team that had already locked up the worst record in the league and which came into Tuesday having lost a remarkable 32 of its last 35 games. For the Mavericks to lose to these Suns, it would take an egregious and borderline shameful display of tanking. Also it was Fan Appreciation Night. The game was preceded by a message from star rookie Dennis Smith Jr., who took a microphone to half court and thanked the fans for supporting the team. He told them that there is no city where he’d rather play, and no team he’d rather play for. And then he went back to the bench. He would not be playing in the game. Fans who showed up 90 minutes before tip-off came the closest to seeing Smith play that anyone could have—he practiced some free throws and worked on his jump shot before most fans made it into the arena. Valarie Ruiz, a Suns fan, and Alex Cervantes, a Mavs fan, had come to the game together, and were already in their seats. Luckily for them, Devin Booker—the Suns’ best player and “the love of Ruiz’s life,” she said—was getting some practice in on the other end of the court. Booker would not play in the game either. Ruiz and Cervantes paid $65 each for their tickets. There wasn’t much question to whether the players listed as “questionable” would be taking the floor. The Suns sat Booker, Josh Jackson, T.J. Warren, Marquese Chriss, Troy Daniels, and Tyson Chandler. 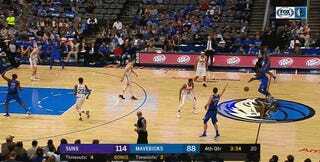 The Mavericks sat or did not have available Smith, Dirk Nowitzki, Harrison Barnes, Wes Matthews, Nerlens Noel, J.J. Barea, and Doug McDermott. Salah Mejri was available to play only in case of an emergency. “We’re going to play it out,” was how Mavericks coach Rick Carlisle described the plan for the team’s last game. “We will have enough players to play.” He wasn’t wrong, but Aaron Harrison did play all 48 minutes. Carter and Marissa Meneley are Mavericks fans living in Denver. The married couple bought their tickets a year ago in the expectation that it would be the last game of Dirk Nowitzki’s career. They paid $110 for each of their tickets, on top of the cost of travel. Before the game, Nowitzki, who’d undergone minor ankle surgery a week prior, confirmed before the game that he was planning on returning next year for his 21st season. “He probably could have waited until the end of the season and played it out,” Carter speculated of his favorite player. 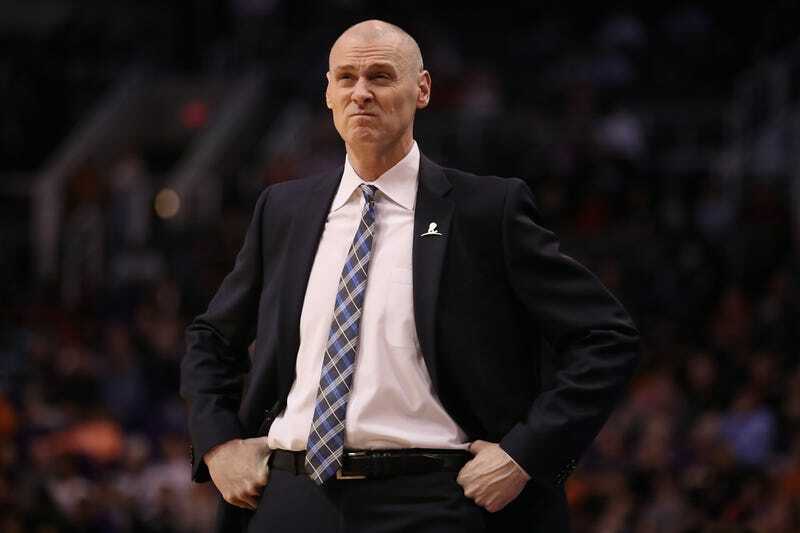 Less than 20 minutes earlier, Carlisle wound up echoing Carter’s speculation while praising Nowitzki’s durability, noting, “He could have played out the last five [games] or whatever it was.” But of course he wouldn’t have played on Tuesday, either. With plenty of open seats still available, the two teams gamely attempted to “play it out” in the first half. 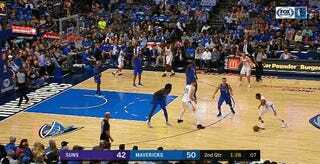 Even without the entirety of their team’s core, the Mavericks quickly realized that laying down against a team as deft at losing as Phoenix would be no easy task. It’s not that every player that suited up for the two teams was bad at basketball. In relative terms, they’re still among the best basketball players alive, and more precisely some of them might be good enough to have future roles on NBA teams. But these are complementary players, and there was never a legitimate creator on the floor for them to complement. That vacuum was palpable throughout, and what resulted was a lot of meandering aimlessness. It often looked like both teams were running extremely simple plays that had just been shown to them for the first time. The broader Process-ification of the NBA is as undeniable and inescapable as the weather at this point. It’s not just wised-up, forward-looking fans that acknowledge the grim logic behind the strategy of losing to accumulate higher draft picks, and at any rate the practice is now widespread enough that it feels silly to argue against it. But there’s also a sort of Stockholm Syndrome vibe that comes with hearing that practice rationalized out loud by fans that chose to attend this game. Losing felt like their only way out of more losing, that was clear. But that naturally led them into some strange places; throughout the game, you could see small pockets of fans in Mavericks’ shirts cheering whenever the Suns scored. In the second half, Knobler got his wish. The Mavericks ran what was essentially a glorified practice session, and in the process managed to pull off one of the most impressive in-game tanking feats that the league has ever seen. The Suns outscored the Mavericks 80-43 over the last two quarters. The level of audience engagement and attendance had shrunken so much by that point that I managed to snag a seat in the seventh row for the entire fourth quarter. Few of the conversations near me were about basketball, but the fans who were committed enough to stay through what unexpectedly became a Suns 27-point blowout still went through the motions. Many of them still went absolutely nuts over the prospect of an at-least-partially-cotton XL t-shirt being shot in their direction. Shaquille Harrison and Danuel House of the Suns were the only active players generous enough to provide some actual NBA-grade highlights, and very thoughtfully obliged with a few. The crowd seemed ambivalent at first about Harrison and House’s fourth-quarter alley-oops and breakaway dunks, but ultimately decided that they were cool and worth applauding, regardless of which team was delivering. As the final seconds ticked off, the remaining crowd rose in a reluctant and half-hearted standing ovation; the precise balance of sarcasm and sincerity in the gesture was, I am sorry to say, indecipherable. Miguel Evangelista, at least, was easy to read. He was slumped in his seat with his hood up while nearly everyone else filed out of the arena. Evangelista had flown in from San Francisco for the game, also thinking it could have been Nowitzki’s final game, and he thought that it was a bit excessive for Dallas to hold Dennis Smith out of the contest. What he had just witnessed—what he had flown for hours to see—could barely have been called NBA basketball, and he knew it. And yet, on this game’s strange terms, Evangelista got to see his Mavs do what they needed to do.